Liquid chromatography-mass spectrometry is great in research settings, but can it help in your hospital lab? This author says yes. The sheer power and accuracy of liquid chromatography-mass spectrometry (LC-MS/MS) is undeniable. It has earned a reputation as the analytical “gold standard,” delivering high quality and specificity, particularly for small molecule analytes including drugs of abuse, therapeutic drugs, immunosuppressants, steroids, and vitamin D metabolites. A growing number of hospital laboratories are starting to consider the value it can bring to them not in the distant future, but now. By offering the benefits of time savings, cost savings, and improved patient care, LC-MS/MS could be one of the clinical laboratory’s most important improvements in decades. While the trend toward the clinical adoption of LC-MS/MS is gaining momentum, only approximately five percent of LC-MS/MS instruments are actually used in the clinical lab today. The rest are in research settings, academic institutions, or reference labs. The clinical laboratory then presents a leadership opportunity for people in the in vitro diagnostics industry who can apply real innovation to current practices. Only around 5% of LC-MS/MS instruments are used in the clinical lab today. All laboratories seek to provide an accurate result to support the physician’s role in treating patients effectively. 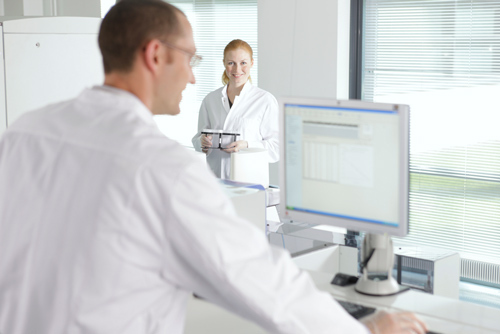 LC-MS/MS is an excellent option to deliver high quality; however, the issue is complexity. Josh Bornhorst, director of chemistry, immunology, point-of-care, and pediatric clinical laboratories, University of Arkansas states, “Turnaround time is also a major factor for labs, and time is lost when samples go out to reference labs for testing. We now have to send out drugs of abuse confirmations, but we could do them in house with mass spectrometry.” He estimates that LC-MS/MS at the university medical center could reduce turnaround times from two to four days for outsourced tests to a matter of hours for in-house tests. “That would improve patient care,” says Bornhorst. Immunoassays are the primary method for specialty diagnostics in clinical hospital laboratories. They can be run at high throughput on automated analyzers but have quality drawbacks due to cross-reactivity and interferences of closely related compounds such as metabolites of other drugs with similar core structures. LC-MS/MS technology is different. It separates analytes chromatographically then ionizes molecules to further separate them by mass-to-charge ratio and directly measures the concentration of a particular analyte. Immunoassay manufacturers are limited to assays where a suitable antibody can be developed. LC-MS/MS, however, does not have this constraint, since it does not require antibodies in the method formulation. Because of this, the potential for menu growth either by the laboratory (via lab developed tests) or the manufacturer (via vendor developed tests) is significant. LC-MS/MS also overcomes the issue of waste. If you don’t use all 100 tests in an immunoassay kit before it expires, the rest must be thrown away. LC-MS/MS, by contrast, is “reagent-less,” using primarily an internal standard, which is stable for longer periods of time and is used in small quantities. Laboratories can also run panels of tests with just a small amount of patient sample and internal standard, which improves the yield vs. immunoassay kits. This can have a positive impact on the finances of the lab, potentially lowering the costs on a per test basis. Unfortunately, only highly skilled specialists can make use of the current research-class LC-MS/MS instruments used today. The problem starts with developing and validating assay methods in the first place—a task which can take up to six months or more to complete. Mohammed is not alone. Hospitals have a strong preference for ready-made methods, shifting the risk away from the laboratory and to the vendor. In addition, each test, as well as the system itself, should be approved by the appropriate regulatory authorities for routine clinical use (i.e., FDA 510k, or CE/IVD mark). That’s not how it is with today’s generation of LC-MS/MS instruments. We’re on the cusp of a breakthrough in specialty diagnostic testing, close to having LC-MS/MS in many different types and sizes of hospital laboratories. Ideally, the new technology will offer a fully integrated and automated system that includes FDA cleared and/or CE-IVD marked methods, software, accessories, consumables, along with reliable service and support. The analyzers should look and behave like the ones that current laboratory technologists already use in the clinical hospital environment and are confident with operating. If the new technology passes muster, it holds the potential for true transformation of the clinical laboratory by providing highly specific and accurate testing in a random access format that is easy to use, reducing sample transport costs, saving significant time, and freeing capacity in central labs to develop new high-margin esoteric assays. “For a laboratory that already uses LC-MS/MS analyzers, it would also eliminate the need for batching, allowing random access workflow that would get doctors and patients answers more quickly,” notes Royal London Hospital’s Benton. Furthermore it can free up the capacity of open LC-MS/MS instruments to develop new high-margin esoteric methods and offer expanded services to physicians with a competitive menu. Although the benefits of LC-MS/MS are tempting, there are further kinks that need to be worked out before it’s a reality. With these requirements covered, LC-MS/MS’s potential value will only grow as new biomarkers are discovered. Mohammad sees its increasing applicability to a wide range of low-volume esoteric assays, such as those to diagnose conditions in newborns and young children. Examples include organic acidurias, amino acidurias, and congenital adrenal hyperplasia. He also sees applicability to the therapeutic drug monitoring of new classes of cancer drugs. Bori Shushan, Ph.D., is the founder of Clinical Mass Spec Consultants, where he advises industry and institutions in the use of LC-MS/MS with specific emphasis on clinical applications. He is a consultant for Thermo Fisher Scientific. 1 “Global Vitamin D Testing Market 2010–2014,” TechNavio, January 2012. 2 “New advances in pain management screening and confirmation,” MLO Online, last accessed August 1, 2013.